The Triangle Kayakers & Beyond, the Kirby Family, Great Outdoor Provision Co. and the Jordan Lake EagleCam Viewers all had their first cleanups in April and May. The Triangle Kayakers & Beyond group is tackling a perpetually littered section of shoreline off Martha's Chapel Rd. They will also be removing bottles and rusted metal that are buried in an old dumping pit just a short distance away from the shoreline. Several plastic tubs (see photo) were filled with bottles dug out from the pit with a shovel. The tubs were hauled down a long narrow path to the roadside for transport to a Chatham County Collection Center. Many more tubs will be used to get the job done during future cleanups. The Kirby Family has adopted the east side of small cove that ends at Lystra Rd. This group includes school friends of their children as well. They are trying an experiment to combat littering. A trash barrel will be brought to the site to offer shoreline users an alternative. Chad (L) is manager of the Chapel Hill store and Aubrey (C) and Mike (R) are members of his staff. 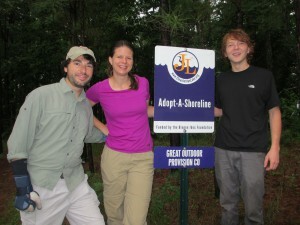 Great Outdoor Provision Co. of Chapel Hill has adopted the west side of the cove ending at Lystra Rd. Like the east side, this stretch of shoreline is a very popular fishing spot. Unfortunately, beer bottles and cans, fast food wrappers, fishing line and blue plastic worm containers are strewn everywhere. A narrow path winds along the shoreline for about one-half mile and litter is all along it. The Jordan Lake EagleCam Viewers group has adopted paths on either side of Rt. 751 that lead down to the White Oak Creek shoreline. Litter along the roadside near the bridge over the creek is also an eyesore. So this group is cleaning here as well. What makes the group unique is that most of its members live far away from the lake. They are brought together by a shared passion for protection of the eagles. In fact, the Corps's eagle cam nest is nearby their adopted site. Nancy Chadwick, for instance, came all the way from Winston-Salem to participate in their first cleanup. In fact, 9 others showed up from far away places as well. Nancy said that "The tires were a surprise to me – they kept rolling them up out of the woods. ...I am sure that the eagles at our nest are feeling relieved already by the removal of trash, old signs, car parts, belts of nails for automatic nail guns, garden hoses – just your regular junk, nothing dramatic. However, one little woman was determined to get the tire with all the metal still attached, and she cut roots and dug it out with her handy pen knife." Together these four groups removed 30 bags of trash and six tires in their inaugural cleanup events.